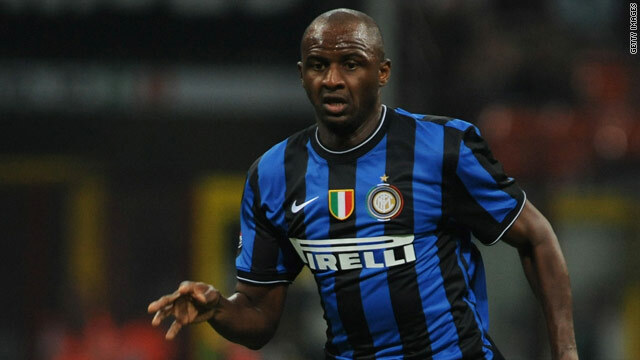 Jose Mourinho has confirmed Patrick Vieira has played his last game for Inter Milan and is set to join Manchester City. Patrick Vieira's move to Manchester City appears to have moved a step closer according to Inter Milan coach Jose Mourinho. English Premier League City had been linked with a move for the 33-year-old midfielder who has a stop-start career at the San Siro. Juan Sebastian Veron has rejected the chance to join City and intends to see out his playing career at Argentinean club Estudiantes. Patrick Vieira's move to Manchester City appears to have moved a step closer after Inter Milan coach Jose Mourinho confirmed he has played his last game for the Italian club. English Premier League side City had been linked with a move for the 33-year-old midfielder who has a stop-start career at the San Siro since his move from Juventus. Vieria played in Inter's 1-0 win over Chievo and Mourinho paid tribute to his contribution to the club after the match and confirmed his impending departure. "In particular Vieira was great in his last game for us. He is a player that we will certainly miss now that he is leaving," Mourinho told reporters. "It was the best way to say goodbye to us and I wish him all the best in his new life. I don't know where he is going. He doesn't have to tell anyone. England? I think so. "We couldn't have stopped him from leaving." City manager Roberto Mancini revealed earlier in the week he was interested in taking the former Arsenal midfielder on loan till the end of the season. Vieira has not been a regular starter since he moved to Inter and the player will be keen to prove his fitness and form in a bid to force his way into France's squad for the World Cup in South Africa. Meanwhile Juan Sebastian Veron has rejected the chance to join City after the experienced midfielder admitted that he intends to see out his playing career at Argentinean club Estudiantes. Veron, 34, told Argentinean radio station La Red: "I talked to Mancini, but it's not possible now. It's not about money. He is a player that we will certainly miss now that he is leaving. "First comes my family and second it's because I made a decision and I want to respect it. This is what I feel and this is the place in which I am comfortable. "To accept it would be going against my convictions, against myself and against the people. "I presented the offer to the club directors so they could analyze it. But on my part there wasn't a lot to think about. My response was instant." Elsewhere, Atletico Madrid are closing in on a move for Juventus midfielder Tiago who is set to move to the Spanish La Liga club on loan until the end of the season.